RockAuto and PowerNation want you to drive home a new truck. 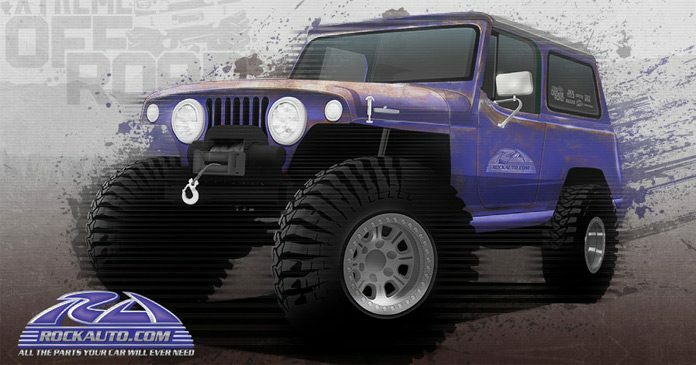 Visit rockauto.powernationtv.com and enter the 2017 RockAuto XOR Adventure Sweepstakes for a chance to win a 1968 Jeepster Commando with performance upgrades valued at $20,000. The 2017 RockAuto XOR Adventure Sweepstakes is open only to legal residents of the 50 United States and the District of Columbia (specifically excluding Guam, Puerto Rico, and all other U.S. and foreign territories and possessions) and all provinces of Canada (specifically excluding Quebec), who are the age of majority in their state or province of residence at the time of entry, and currently reside in the Eligibility Area at the time of entry. Begins at 12:00:01 PM CT on August 23, 2017 and ends at 11:59:59 AM CT on December 22, 2017. There is a limit of one entry per person, per email address, per week. The potential prize winner will be chosen by random drawing on or about December 29, 2017 and notified on or about January 5, 2018 from all eligible entries received. The potential winner will be notified by RTM by UPS overnight delivery, e-mail and/or by phone, and the potential prize winner’s name will be posted on www.powernationtv.com on or about January 19, 2018. One Prize Winner will receive a 1968 Jeepster Commando with performance upgrades. The approximate retail value of the prize is $20,000.00 USD. For the name of the winner, please send a stamped, self-addressed envelope to RTM Productions LLC., Attn: “The 2017 RockAuto XOR Adventure Sweepstakes”, 130 Southeast Parkway Court, Franklin, TN 37064, by December 22, 2017. The sponsor and administrator of this Sweepstakes is RTM Productions, LLC 130 Southeast Parkway Court, Franklin, TN 37064.